Valkyrie– the strongest of all Valkyrior (a group of Asgardians warrior goddesses who bring the worthy fallen warriors to Valhalla, the land of the honored dead). At this time in Marvel continuity, the Valkyrie had possessed the body of Barbara Denton and joined the super-hero team, the Defenders. 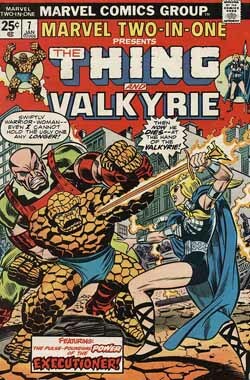 After the events of last issue, Doctor Strange suggests the Thing venture to Cobbler’s Roost, Vermont to find Valkyrie. Meanwhile, Strange intends to find the derelict, Alvin Denton, who was present at last issue’s subway event – for his destiny may need to be tended to, as well (see last week’s post, if you’re confused). 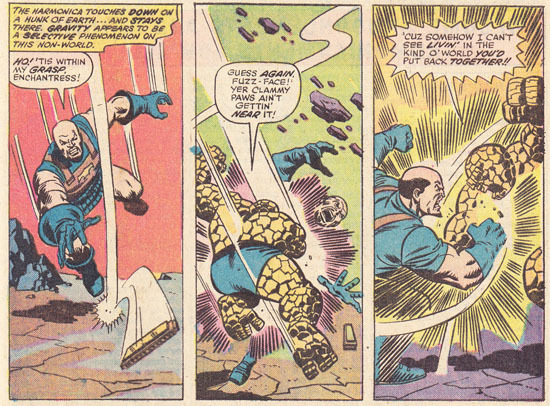 Before he can reach his destination, the Thing is ambushed by the Enchantress and Skurge the Executioner (who have already captured Alvin Denton). The villainness reveals that it was she, disguised as Valkyrie, who took the harmonica. But, she cannot yet harness its power until the course of Destiny, which was altered by last issue’s events, has been put right. Once Destiny’s will has been worked out, the villains intend to utilize the harmonica’s power to seize control of Asgard. So, they take their leave (with the harmonica), to allow Destiny to play through – their captives now freed. Alvin asks the Thing to go to Cobbler’s Roost, for he has a bad feeling that his daughter is in danger. 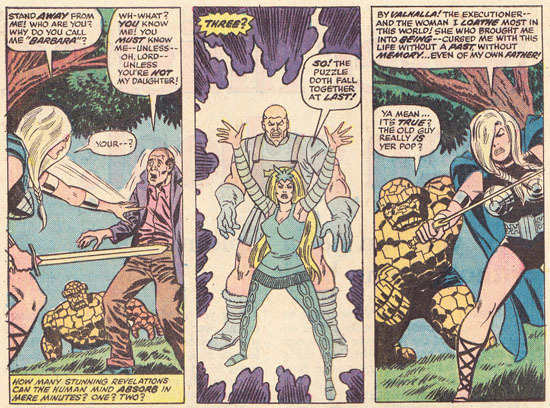 And, when they find her, the Thing discovers that his daughter is Barbara Denton – the woman who is possessed by the Valkyrie’s spirit. As he rushes to embrace her, it quickly becomes apparent that Valkyrie does not recognize the man – even though he fathered the body she now possesses. With this sad reunion completed, the Executioner and the Enchantress reveal themselves – taking enjoyment from the heartbreak. Desperate to fix the situation, Alvin yanks the harmonica from her clutches and blows into it. Immediately, the world is destroyed and only those five nearest the harmonica are still left in existence. The Thing and Valkyrie move quickly to stop the Executioner and the Enchantress from grabbing the powerful instrument. Whoever gains control of it will have the power to set everything right – but if the villains get it, they can recreate the world without the heroes (or other heroes like Thor, the Avengers and the Defenders). In the final battle, the heroes narrowly defeat the Asgardian renegades and the Thing uses the harmonica to put everything back the way it was. But, it is a hollow victory – for Alvin’s heart gave out during all the excitement. Valkyrie’s last remaining link with humanity has now been severed. Most of the events of this issue take place in Cobbeler’s Roost, Vermont – the hometown of Barbara Denton. WHEN do the Enchantress & Executioner next appear? They next appear in the Defenders #20 (cover date: February 1975), as Valkyrie continues her quest to unlock her own identity. Doctor Strange and the Thing can also be found in that issue. WHY is Valkyrie the guest-lead? The very next month, Steve Gerber took over as writer of the Defenders so this was a fun attempt at getting more people interested in that book. This was certainly a neat way of turning MTIO fans into potential Defenders fan. Or, at least getting them interested enough to pick up the first issue of Gerber’s run on that title. But, it was a strange story. It was very much about Valkyrie, although she doesn’t actually do all that much in the issue. On the other hand, a most of the action is focused on the Thing but, he doesn’t get any character development. As for the stakes, they’re sky high! Essentially, the entire planet is destroyed – and then neatly put back into place just five pages later. Ahhhhh the days before comics were decompressed into six-issue storylines. Note: This issue’s letters column features commentary on Marvel Two-In-One #5. Additionally, this comic includes Marvel Value Stamp #45 (Mantis).